Tag Heuer may be as veteran as they get, when it comes to luxury watchmakers, with the Swiss company having been in business for a good century and a half. Elderly legacy aside, though, not all of Tag Heuer’s products fall into the category of classics. Many of these timepieces stand proudly modern, and this seems all the more clear when considering the Formula 1 Grande Date WAH1010.BT0717. Many luxury watches feel half like jewelry when looking at them, weather targeted towards men or women alike. The Grande Date, though, strikes me very much as a utility and a tool. Despite obviously being a high-end device, it has a firm, functional design, its overwhelmingly monochrome color scheme and functional grip-supporting components lending it an inherent appearance of usefulness. In truth, the visual design of the Grande Date doesn’t appeal to me personally, but you have already seen the picture and can decide that for yourself. This is partly the bezel with the large numbers; clearly unidirectional, this adds another functional element, allowing for some moderate timing despite the lack of a chronograph. If you intend to use such a thing frequently, this would clearly be useful, and the large, unabashed display of numbers around the bezel would be helpful. If not… well, I couldn’t personally see them as anything but distracting. The watch face is nothing too unique, although the more I look at it, the more I see that some care went into its design. The variations of the symbols marking various times is interesting; small lines for the seconds, filled rectangles on the three hour marks of 3, 6, and 9, with a superior-looking triangle topping the 12 o’clock position. While interesting, though, these are just shapes, all white-on-black; again, nothing flashy, but if you’re looking for a utility, this may be perfect. Seconds are displayed in their own small dial, the main face lacking a second hand, and the date is nestled in the bottom of this sub-dial. This seems more confusing than necessary, but it does add a little bit of style that the watch could use. A very interesting function of the Grande Date is that when its battery begins running low, the second hand jumps by 4-second intervals every 4 seconds, instead of its normal smooth movement. This provides a noticeable but unobtrusive warning regarding battery life, one which I found very clever. 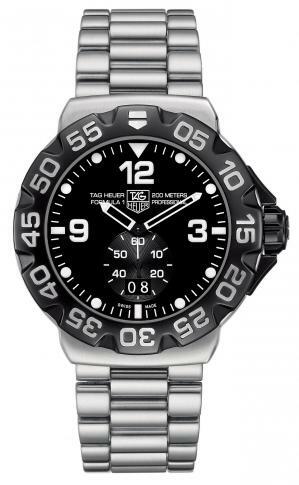 My last bit of praise goes not to the watch itself, but Tag Heuer’s website. This site provides levels of detail that I have yet to see from any other watch manufacturer. Being able to access material details, cleaning instructions, quality assurances, and functional features, along with the usual specification lists, is really a breath of fresh air for those looking for details on their prospective purchase. If you find yourself at all interested by the Grande Date, go to the site and I’m sure you’ll find more information than you’ll ever need. With a listed price at $1,100, the Grande Date seems well-valued as a solid time-telling companion, and will undoubtedly provide many years of service. If you’re tired of seeing flash on your watches and want something relatively low on the luxury price-scale that offers a fine array of functions, you could do far worse than to consider this particular timepiece.